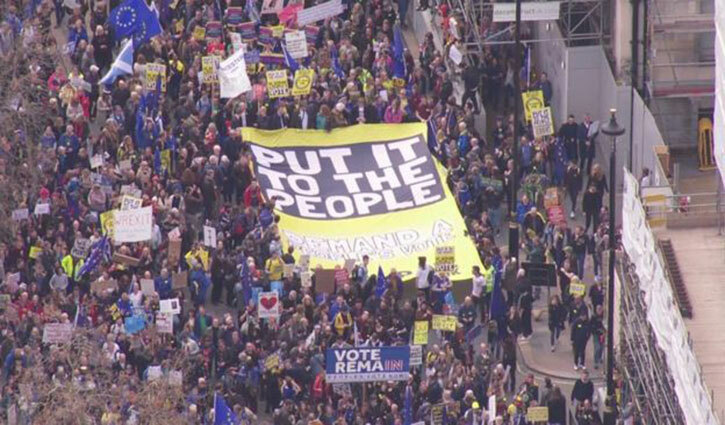 International Desk: Hundreds of thousands are marching through central London calling for another EU referendum, as MPs search for a way out of the Brexit impasse. Organisers of the "Put It To The People" campaign say more than a million people have joined the march before rallying in front of Parliament. Meanwhile, a record-breaking online petition on Parliament's website calling for Brexit to be cancelled by revoking Article 50 has attracted more than 4.3 million signatures. Speakers at the rally have included Labour's deputy leader, Tom Watson, Scotland's First Minister, Nicola Sturgeon, London Mayor Sadiq Khan, former Tory turned independent MP Anna Soubry and former attorney general Dominic Grieve. Speaking from the top of an open-top bus, Mr Farage said those gathering for the People's Vote march in London were not the majority, before leading the crowds through the village.